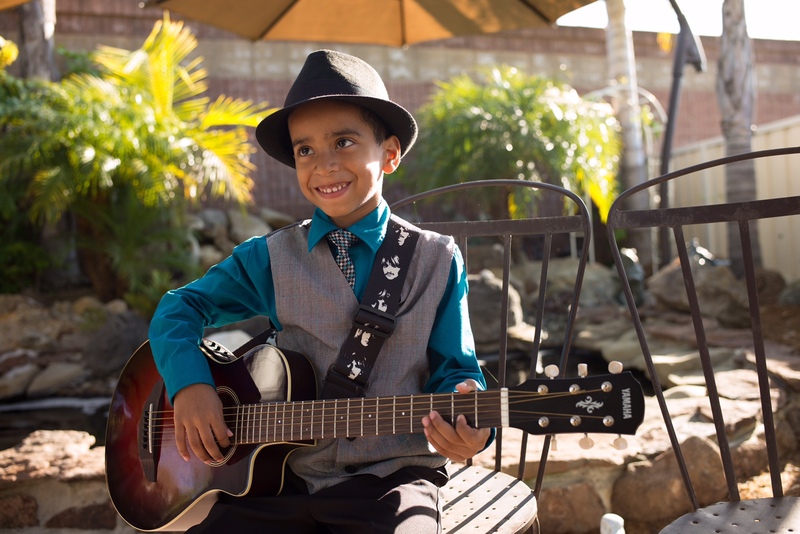 A 6-year-old San Jose, California boy and avid Beatles fan, King Tobias, is living the musical dream of his young life. The precocious guitar player, who, in less than one year of lessons, has already mastered numerous songs by the Fab Four, got to meet two of his musical heroes (or, in King’s word, ‘brothers’): Ringo Starr and Paul McCartney. King Tobias. Photo credit: Richard Kerris. King’s mother, Cali Tobias, feels a particular sense of urgency in helping make her son’s musical aspirations reality: she has battled breast cancer four times since the age of 20 over a decade ago, and is currently fighting ovarian cancer. Today, her son is taking guitar lessons from a local college student, and is performing at his school’s show-and-tell and at the talent show at the end of the year. However, his school does not have a formal music education program for students King’s age; music lessons, Cali said, start in the fifth grade. While King’s talent and dedication at 6 years of age suggest a future of limitless possibility, his entry into the world was perilous. King, who has an older sister and younger sister, is the sole survivor of triplets. Born premature in 2008, doctors said he would have lingering health issues. Cali Tobias is pictured with her children: Daughter Jade, 16; son King, 6, and daughter Brooklyn, 3, along with the family dog Dallas Blue. Photo credit: Cali Tobias. King’s musical experience continued at The Stanford Cancer Center, where he accompanied his mother as she was getting treatments following breast cancer surgery. Cali Tobias is shown with her husband, Kasino. 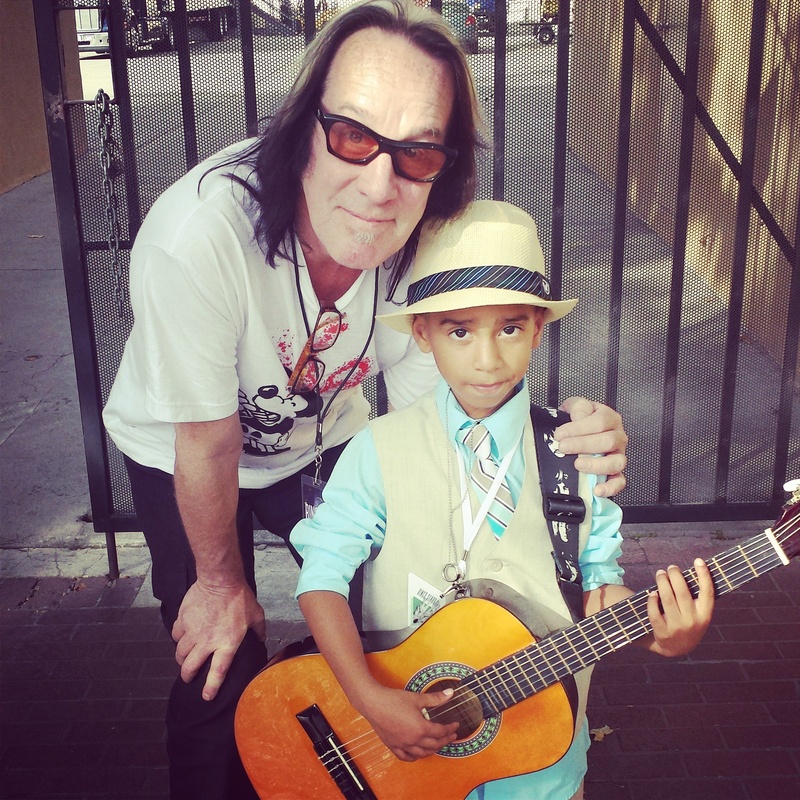 As King continued to perform with Nichols at the Stanford Cancer Center, Cali realized she needed to buy her son a guitar. A serendipitous occurrence happened when Cali picked up the tickets. Kerris was not only impressed with King’s playing, but noticed he had dressed up for the occasion. Todd Rundgren, a member of Ringo Starr’s most recent All-Starr Band, helped get word to Starr that King was interested in meeting him. Photo credit: Richard Kerris. He said he told King to stay where he was and that he was going to go talk to someone he knew backstage. Kerris introduced Rundgren to King. “Todd basically had him audition: ‘Ok, let’s hear you play something,’” Kerris recalled. Kerris said they went back outside, found King and Cali, and brought them backstage. King’s dream of meeting a Beatle was about to come true. For more information on King Tobias, visit his website at: www.KingTobias.net. To listen to his recent interview on Rundgren Radio, visit http://www.blogtalkradio.com/runt. If you would like to make a donation to help defray the mounting costs of Cali Tobias’ medical bills, please click here. Part 2. Meet the Beatles. 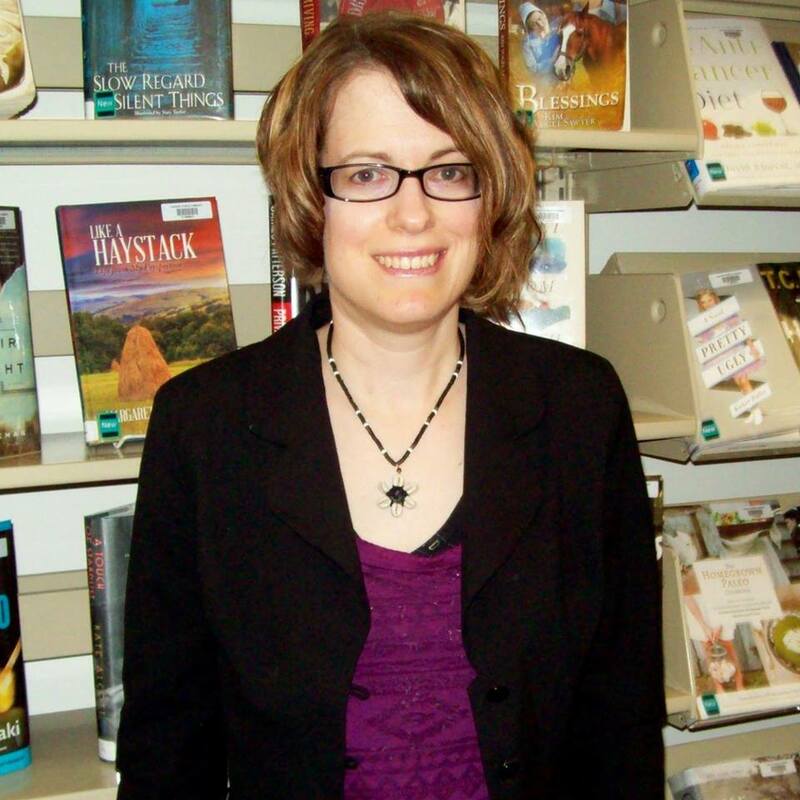 Sara Stromseth-Troy is a freelance newspaper feature writer and public library worker who specializes in social media and publicity. Fortunate to grow up surrounded by an extended family of music educators, she is honored to volunteer in blog writing and social media for The Spirit of Harmony Foundation. She lives in Cresco, Iowa. Here is part 1 of a fabulous article written about Kings first experience meeting Ringo, Paul, Todd, Richard & Scott AKA his other brothers!